J.T. 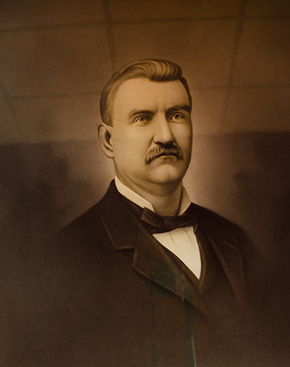 Henderson, of Newton County, was appointed as the Commissioner of Agriculture on August 29, 1879 by Governor Alfred H. Colquitt, immediately following the resignation of Hon. Thomas P. Janes. Almost a year after his appointment, he called a convention of Agricultural and State Chemists to be held in Washington, D.C. The purpose of this convention was to establish a uniform method for analyzing commercial fertilizers. Commissioner Henderson was elected as president of this new organization, which would soon be reorganized as the Association of Official Agricultural Chemists. Throughout his tenure as Commissioner of Agriculture, Henderson urged the Governor and the General Assembly to create an agricultural experiment station. Beginning in 1880, he made such appeals in each of his biennial reports. Congress aided his pursuit with the passage of the Hatch Act, which allocated $15,000 annually to state governments for the operation and maintenance of an agricultural experiment station. The General Assembly accepted the terms of the Hatch Act on December 29, 1888, which created an experiment station at the State Agricultural College in Athens. Henderson was reappointed to three full terms as Commissioner of Agriculture and served 12 years from 1879-1890.